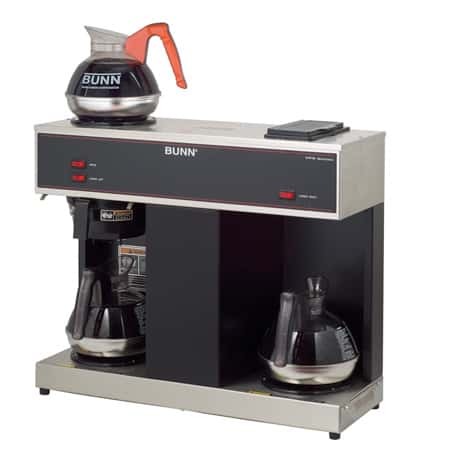 The Bunn iMix-5 Instant Cappuccino Machine with 5 Hoppers comes with an elegant design and a stunning front lit display that is both attractive and eye-catching. The alphanumeric graphics can advertise specials. 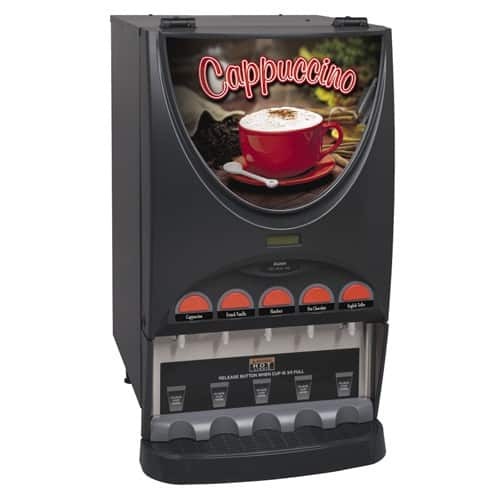 The Bunn iMix-5 Instant Cappuccino Machine immediately stands out with its beautifully-conceived design. Notice all of the curves, which flow better than square corners. The front graphics are lit by LED lighting, which is both energy efficient and more vivid. 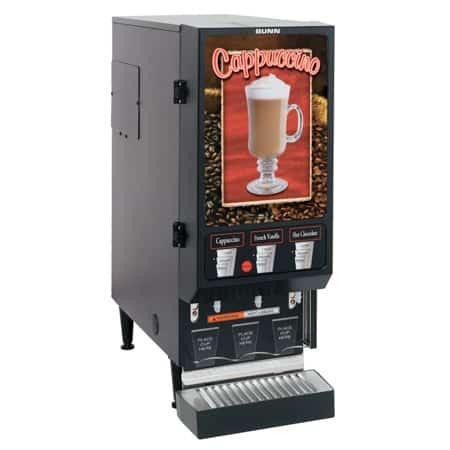 Additionally, the small display window can list advertising messages as well as send alerts when product is low or the machine needs servicing. 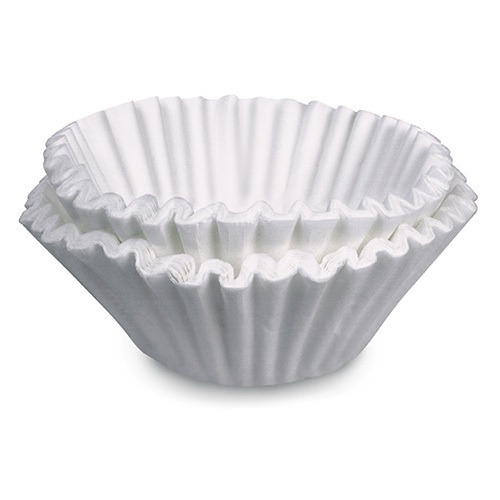 The Bunn iMix-5 has 5 roomy hoppers that can hold enough flavors to satisfy anyone’s cappuccino craving. Each hopper holds 8 pounds of mix, which equals out to 4 standard 2 lb bags. 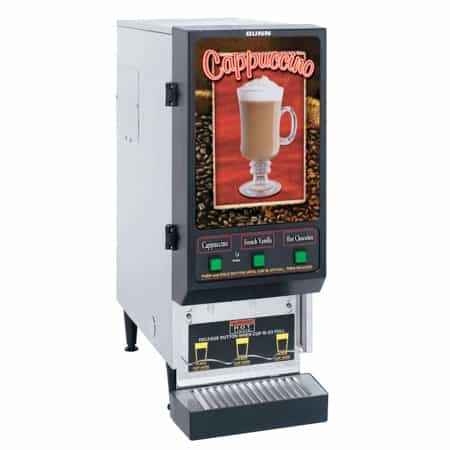 The whipping motor on the iMix is heavier-duty than on most cappuccino machines and allows for better mixing of product and a longer lifespan. The auger that dispenses the powder is also consistently monitored to ensure that the correct amount of powder is dispensed. 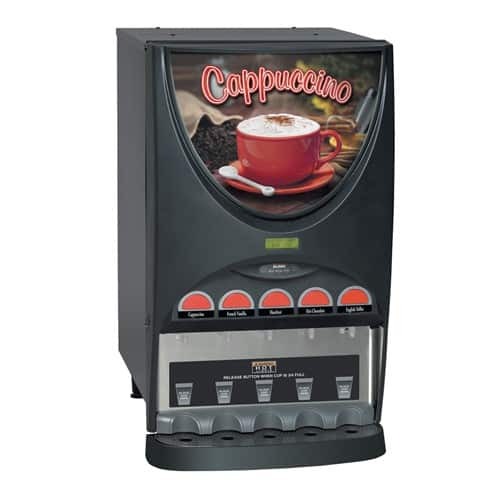 Additional features include a night mode that prevents stealing of product, and easy access to the inside of the machine through the front panel. Options for the Bunn iMix-5 include front door with a hinge on top instead of on the side, and a hot water faucet.